A high-altitude reconnaissance aircraft, whose basic model was developed during the Cold War, will take part in StratoClim, a European research project to study the planet's atmosphere and climate. In 2016, the Russian aircraft M-55 Geophysica will begin flights to study the Earth's climate as part of the European research project StratoClim. The Alfred Wegener Institute for Polar and Marine Research in Germany and the Myasishchev Experimental Machine Building Plant (EMZ), which produces the M-55, signed a contract for the use of the aircraft in February 2015. Scientists from 26 European research institutes will participate in the StratoClim project using data that Geophysica will collect in the stratosphere. They will create a dynamic model of the atmosphere, which will enable scientists to predict the Earth's climate changes for decades to come. According to Gennady Belyayev, the chief designer at EMZ, the characteristics of the aircraft make it indispensable for studying space and enabling astrophysical and astronomical observations. "Our machine is capable of flying at an altitude of more than 21 kilometers and carrying up to two tons of scientific equipment," Belyayev said. The Myasishchev M-55 (NATO reporting name: Mystic-B) is a modernized version of the high-altitude reconnaissance aircraft M-17 Stratosphere, which was conceived in the late 1960s to shoot down U.S. high-altitude reconnaissance balloons. These balloons were inaccessible to Soviet air defense systems at that time. Only high-altitude strike aircraft could solve the problem. The legendary Soviet aircraft designer, Vladimir Myasishchev was entrusted to develop it, but by 1982 when the M-17 made its first flight, the problem of the high-altitude balloons lost its relevance and the aircraft was reconfigured for reconnaissance. 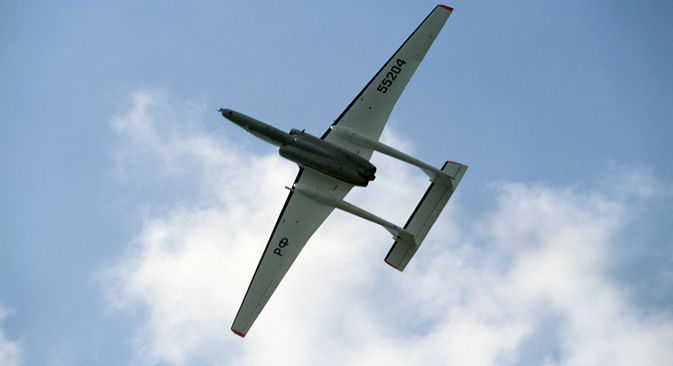 The M-17 was developed into the two-engine aircraft M-55, which was upgraded into the M-55 Geophysica. The aircraft found itself to be in demand by the international scientific community almost immediately. So, in 1999, the M-55 took part in the Airborne Polar Experiment to study the state of the ozone layer near the South Pole. Ten countries, including Italy, Germany, Great Britain, Spain, the U.S., Brazil and Chile participated in the program. In 1995 the aircraft was equipped with Italian technology. In many ways Geophysica bypasses its counterparts. "In contrast to the American TR-1, our aircraft does not need special fuel," EMZ's press service told RBTH. "The flight of similar aircraft is comparable to a spacewalk due to low pressure in the cabin. The pilot has to prepare for such flight for a few hours, but with Geophysica, such preparation is not necessary." Flying at an altitude of 20 kilometers is complicated due to low pressure and the fact that the air temperature can drop to -90°C. For example, this happened when Geophysica flew over the Seychelles. "Before the flight we consulted with American colleagues who previously used the U-2 there about the ultralow temperatures," EMZ's press service told RBTH. "According to them, when temperatures are below -70°C it is possible to fly for no more than 15 minutes, because the fuel thickens and becomes jelly-like. However, it did not happen to us due to the design features of the aircraft." To participate in the project StratoClim, the M-55 should be upgraded; the corresponding items were included in the contract signed by the Russian and European sides. The exact amount of the deal was not reported, but it is known to be worth several million euros. "The aircraft will be more state-of-the-art due to its use of digital technologies", EMZ's press service pointed out. The modernization plan is slated for completion by the end of 2015 when scientists will begin studying the seasonal movements of tropical air masses during the Asian monsoon period. The peak of this phenomenon will be observed in India. This is where flights of the upgraded Geophysica will be conducted in summer 2016.